FP: Please describe the new album in detail. Is “Death Throes of the Terrorsquid” a glimpse of the future, or how did that song come about? Chris B: It's a glimpse of the past, really! I wrote that song when I was about 14 years old, but I wasn't in a band that was capable of playing it, so I stuck it in a box for 10 years. But I guess it's cool so we'll do some more stuff like that in future. But yeah our new album is good and has some songs about pirates. FP: How would you rate ”Back Through Time” alongside your previous releases, heavier, catchier, etc? Chris B: It's my favourite one! Captain Morgans Revenge had really crap songwriting, far too much filler material, and cheap sounding production. Black Sails at Midnight was slightly rushed so maybe some of the songs weren't so inspired, but the production was top notch. This time round, we've taken loads of time to write good songs, and we're happy with it! FP: How would you say you have reached your level of success? Bands like SABATON has an outline, how do you work? Where are you most popular? Chris B: We got where we are by being a bunch of down to earth retarded assholes. SABATON seems to be really popular in Poland, which is cool for them I guess, but we get to be popular in badass tropical places like Australia and the USA. We've already done 2 Australia/New Zealand tours in less than a year... most bands don't even get to go once! And we'll be going back to America for the 3rd time in a couple of months. I can't wait! I suppose Europeans like us too, but not as much as compared to these far flung places. FP: What happens next after the release; touring, gigs, festivals etc? Any chance of seeing you guys in Sweden again? Chris B: We've got a mountain of tours lined up, including the Heidenfest tour in Europe in October. Sadly it doesn't hit Sweden. We'd love to go back there, especially to Sweden Rock Festival. The catering there is lovely. And there's a girl with crazy hair who worked at the signing session booth, we all fell in love with her. Do you know her at all? Say hi to her from us. FP: What do you think is your nest step? 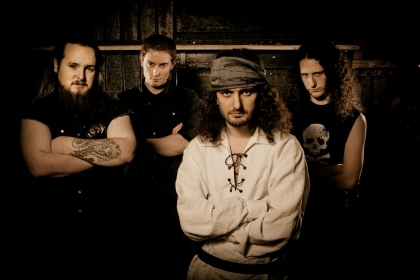 How far do you think this pirate metal genre can go? What will you do to keep ahead of your competition? Chris B: We'll continue to party all around the world doing our thing. Fans seem to like that, which makes us happy. This isn't a competition; I don't feel any pressure to stay ahead of anyone. We have fun doing what we do. Eat Scottish Beef.